20th Century Fox, especially under the auspices of Darryl Zanuck in the 1930s, was adept and successful at historical dramas and literary adaptations. Consider the quality and entertainment value in Lloyds of London, Steamboat 'Round the Bend, Wee Willie Winkie, Kidnapped, Jesse James, Young Mr. Lincoln, Stanley and Livingstone, Drums Along the Mohawk and The Little Princess. Then, as now, the world could never get enough of Arthur Conan Doyle's creation, the consulting detective of Baker Street, Sherlock Holmes. William Gillette was the first to adapt Holmes for the stage and the recently "found" film version of the great actor in the role is a treasure, yet only one of countless screen versions of Holmes stories. 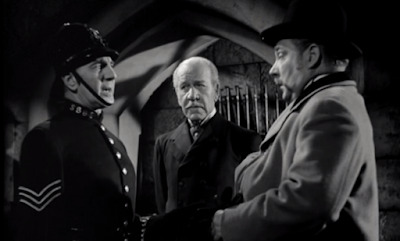 In 1939 another actor was added to the roll call of Holmes portrayers when Basil Rathbone was perfectly cast as the detective in The Hound of the Baskervilles. Ernest Pascal (Kidnapped, Wee Willie Winkie, Canyon Passage) adapted Conan Doyle's story and the film was directed by Alfred Werker (Lost Boundaries, He Walked by Night). Nigel Bruce was tagged to play Dr. John Watson and he and Rathbone displayed a chemistry that immediately captured audience's imaginations. Another success and feather in the studio's cap. The "Hound" was soon followed by The Adventures of Sherlock Holmes. The screenplay by Edwin Blum and William Drake is credited as being adapted from Gillette's play, but I see scant similarities. Nonetheless, the story is a grand, if somewhat messy, pastiche of all we love about the brilliant and quirky Sherlock Holmes. Any old cab in a rainstorm. 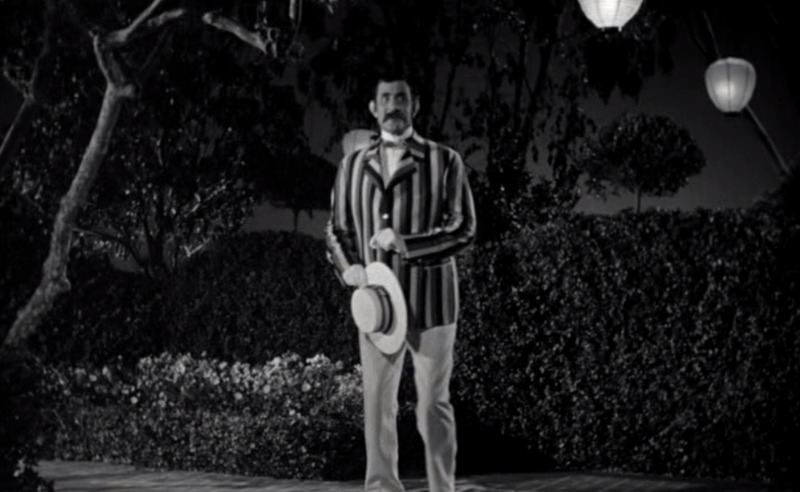 Like the previous film, "Adventures" is set in the 1890s era of the original stories. The exciting opening finds an indifferent Professor Moriarty, played by the one and only George Zucco, on trial for murder. The criminal mastermind has placed the court with no option but to exonerate him of the charge, Holmes arriving too late with critical information. In a shared cab ride through rainy, cobblestoned London Moriarty expresses his distaste for Holmes' constant meddling in his affairs. He informs the detective that he will devise and commit the greatest crime of all-time, thus eliminating the troublesome snoop before a gracious retirement. Challenge accepted. The Baker Street flat is a comfortable abode made more so by its inhabitants. Mary Gordon is a fussy and vague Mrs. Hudson. Terry Kilburn is young Billy who sweeps and tidies while picking up the tips of the trade. Nigel Bruce is the faithful, but befuddled Dr. Watson who supports his friend as we would all like to be supported. Henry Stephenson plays Sir Ronald Ramsgate who is in charge of the safety of the crown jewels in the Tower of London. The imminent arrival of a gift from India of a precious emerald has Sir Ronald concerned. Threats have been made against the gem which require Holmes attention. 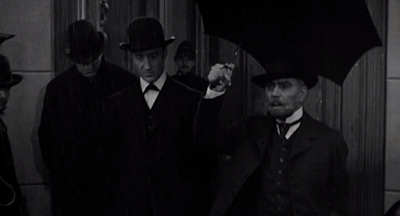 Holmes is not as enamoured of this task as he might be, but agrees to assist Sir Ronald. If ever there was a damsel in distress, it is Miss Ann Brandon. 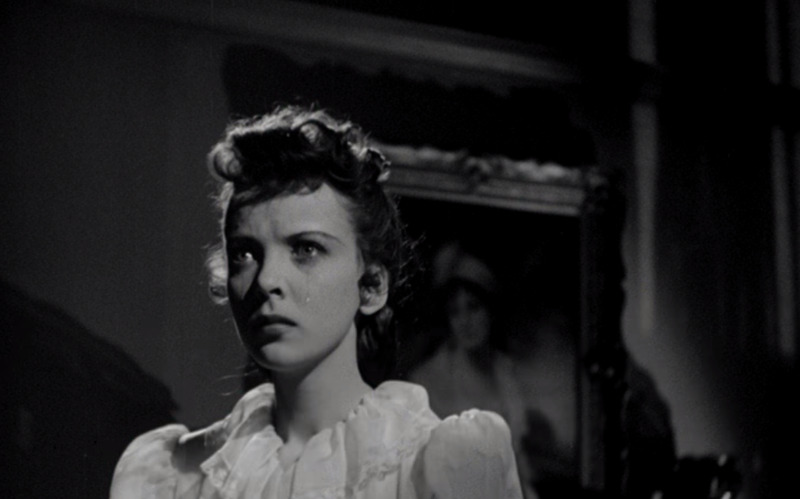 Ida Lupino, on the brink of her break-out roles in The Light That Failed, They Drive by Night and High Sierra plays Miss Ann Brandon. The young society woman is distraught over threatening letters that harken back to her father's murder of a decade ago. She is worried for her brother's life and she has grown distrustful of her fiance Jerrold Hunter played by Alan Marshal. Mr. Holmes is the only one who can help her. 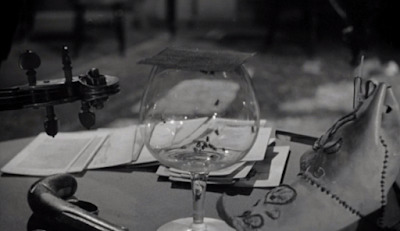 Holmes is intrigued by Miss Brandon and the puzzle she poses which includes a cryptic drawing and exotic music. The death of her brother in a public park by means which elude the police, as exemplified by E.E. Clive as Inspector Bristol, makes the case irresistible. Only good old Watson has the wherewithal to remind his friend that they have another case of equal importance. Ah, have you forgotten about Sir Ronald as well? Man of many disguises and talents. Professor Moriarty hasn't forgotten anything; not his promise to Holmes, not the revenge seeking South American in his employ and not the crown jewels. Ah, Holmes, will you be letting the archcriminal put his plan over? I will certainly not place Miss Brandon's life below the security of the Tower, but isn't Holmes having just a little too much fun in his disguise as a music hall entertainer? Even his own mother wouldn't know him. Holmes' enjoyment in his role may almost match Moriarty's pleasure in playing one officious police officer by the name of Sergeant Bullfinch! I daresay he enjoys this aspect of his plan as much as his constant berating of his servant Dawes played by Frank Dawson or his belittling the brain capacity of his henchman Bassick played by Arthur Hohl. He's a scamp is our Moriarty! The Adventures of Sherlock Holmes simply oozes atmosphere from its foggy city streets to the enticing garden of a country home. Noirish shadows play about London Bridge and the criminal activities in the Tower. Leon Shamroy, who won all of his Oscars (Leave Her to Heaven, The Black Swan, Cleopatra) for colour cinematography paints us a background right out of Sidney Paget's imagination for our characters to play out the story. Why this story wasn't immediately followed with another Rathbone - Bruce outing is a mystery. Was it the timing or availability of personnel, too many other irons in the fire, inability to get a script together? That last thought seems highly unlikely, but whatever the reason The Adventures of Sherlock Holmes is the last we would see of our leads in the Victorian setting. Three years would pass before Basil Rathbone and Nigel Bruce would again play the beloved characters of Holmes and Watson. Universal Studios would revive the series (12 in all) bringing the team to a contemporary setting to settle the Nazi's hash in Sherlock Holmes and the Voice of Terror. Who better? I adore Ronald Howard. It's a grand Sherlock and my sister imagines he would have been equally grand as a star of Doctor Who. There are 14 Rathbone/Bruce pictures all told, the 2 Victorians and 12 mid-century. Each has their strong points and once you start with one, you won't be able to keep from going through them all. Think of it as vacation and choose a couple of weeks strictly for Holmes. You'll love it! 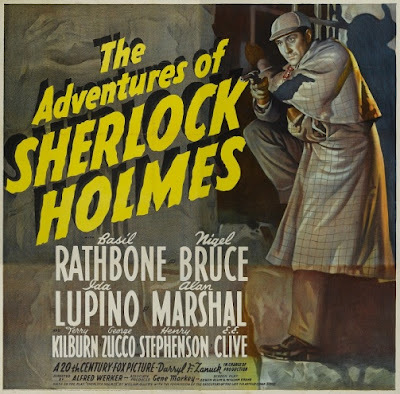 Terrific review of one of the best of all Sherlock Holmes movies. Zucco is one of the two best Moriarty's and, as you point out, it's wonderfully atmosphere. I'm flummoxed, too, as to why there wasn't a third one to follow this one and HOUND. Truly, when they speak of atmosphere surely they are speaking of this movie. I forgot to mention the eerie piece of music that haunts Miss Brandon. If not the stuff of nightmares, then the stuff of a troubled sleep. Rathbone has always been my Favorite Mr. Holmes. Wonderful review. When I read my Conan Doyle it is always the voice of Basil Rathbone I hear in my head. Such a delight as Holmes. I'd never thought about the fine literary/historical adaptations done by 20th Century Fox as a whole, but as I read through your list I realized what a terrific legacy that studio last left us. 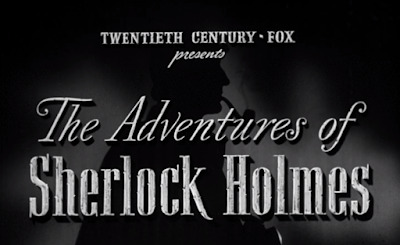 I really must see "The Adventures of Sherlock Holmes". 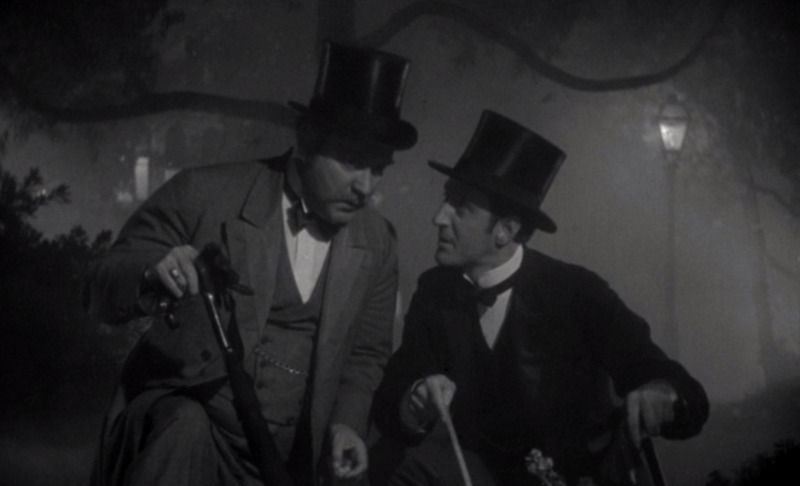 Basil Rathbone and Nigel Bruce in Victorian England is something I've put off for far too long! Yes, a legacy we enjoy to this day. Oh, I hope you watch Sherlock's Adventures soon. You'll have a great time. Love the Sherlock Holmes stories, but I don't remember seeing this one. Ida Lupino? Sign me up. Thanks for another great review! I imagine your memory might kick in after the first couple of scenes, if not then I am pleased to present something new for your movie loving palette to enjoy. Her father was killed in South America years before and at the time the same eerie music now being played in and around the fog bound streets of London, was heard. How does the killer in London know about the eerie music? The gaucho-looking guy that's doing the eerie music - did he kill her father? And oh by the way, what is the motive for killing Ida Lupino's brother (apparently he goes to his death rather willingly early on for no intelligent reason I can think of) and Ida herself? (Well, not her, but you know...) NO MOTIVE, it's all a misdirection!!! And also, why does that stiff shirt who supposedly loves her, rant and rave about Holmes and Watson entering the case and why does he keep insisting that he and he alone can take care that nothing happens to Ida? Terrible character. None of this makes ANY sense. But the movie is still a lot of fun despite the peculiarities. Precisely! That's why I described it as messy, but grand. I have the feeling that large swatches of screenplay never made it to the set or, if it did, there is coherence to be found on the cutting room floor. In my mind, that fiend Moriarty somehow knew of the earlier murder and gave that South American fellow a chance for further vengeance (for something or other) as a distraction for Holmes. After that I just sit back and enjoy the fog. PS: Even as a "tween" I knew that bird was an albatross. Holmes had to go to a museum for the heaven's sake. Watson would lead us to believe that Holmes was indeed his own Google. I have taken to using a Holmesism when referring to my blog. I tell the family that I have written a "well-received monograph" on a particular movie or actor. They roll their eyes. Sigh. Two wonderful movies and the actors that brought them to life. As you know Caftan Woman they were not the first nor the last to play the roles but they have to so many of us been the yardstick by which all others are measured. I am fortunate to own three original costume sketches of the pair from the Hound of the Baskervilles. What an exquisite treasure you have in those sketches. 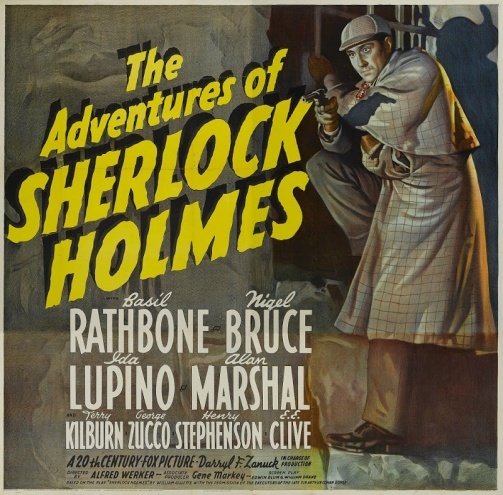 Yes, for many of us Rathbone/Bruce were the portal to the world of Sherlock Holmes, and we're lucky because of it. 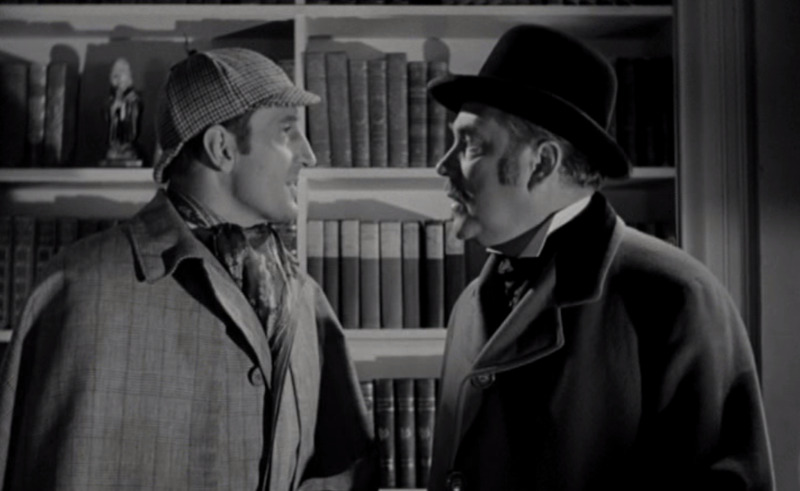 No matter how many Holmes I have seen or enjoyed, it is always Rathbone's voice I hear when reading my Conan Doyle.